This is a UK release by Berry Bros. & Rudd Spirits from the Speyside Distillery, Glenrothes. This Single Malt has been created by marrying carefully selected vintages from the last three decades by Malt Mastert Gordon Motion. Lets open the bottle and have a wee tasting. 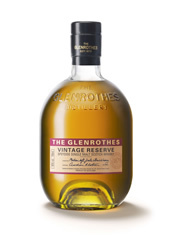 The Glenrothes Vintage Reserve – Speyside Single Malt Scotch Whisky 40% Alc/vol 70 cl. Nose…Citrus burst is first to show, slowly in comes some squashed berries, also here is some toast and marmalade. Taste…Smooth runny honey and a touch of vanilla, newly sawn oak tree, we also have dried berries and unsalted mixed nuts. Finish…Medium finish, sweetness and squashed berries linger longest. This is quite a dram only needing the tiniest drop of H2O. Got to get one for the Whisky Boys Tasting Cabin and at recommended retail price of only £39.99 the bank will not be broken. Highly recommend this to all our readers, a grand dram for not a lot of money.